I have never grown out of the wonder of plants appearing in bare earth. I encourage insects by tending a wild area of garden which grows many indigenous plants that have self-seeded from the local landscape. It is not just the growing plants that are beautiful, but the dying ones are too. I love to observe the shapes created by the dying flowers and I leave the fading blooms of summer in my garden throughout the winter because they are vital nourishment to the insects and small mammals. I enjoy observing the passing seasons and the changes this has on the landscape, and not just the obvious change of Autumn leaves but the increased insect activity in Spring, the flowers that bloom and die in Summer, the wasp feasting on a rotting apple. 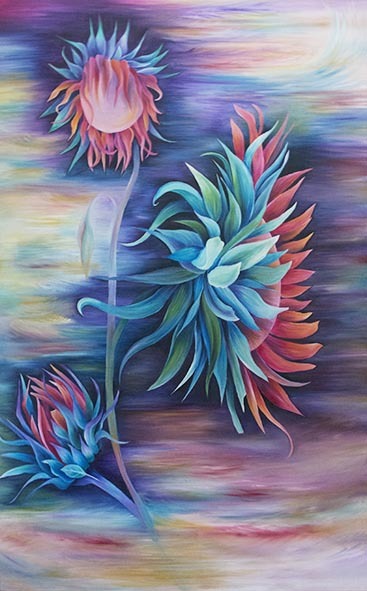 This painting is all about the twisting forms the petals create as Sunflowers die. 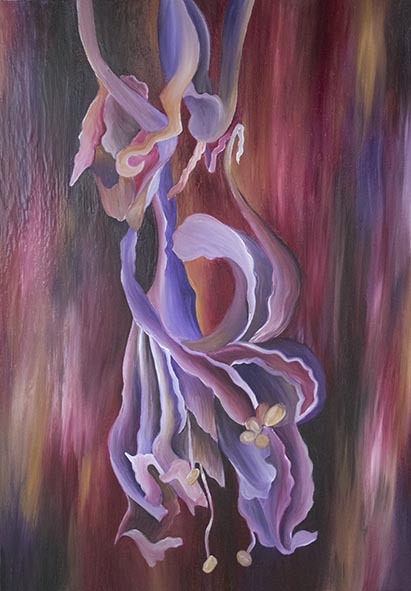 The painting shows three Sunflowers in the different stages of life, from a bud just opening to the fully open to the bloom that is fully over, and its petals hang forward. 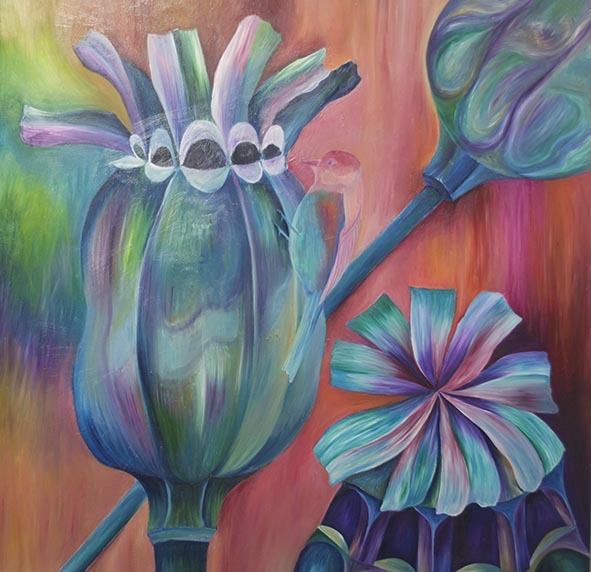 The colours are inspired by an article I read about the insects that see plants in UV light, turning the sepals turquoise and the petals pinky magenta. The Fading Bloom series is not about the sadness of a dying flower but the hope that it gives because dying flowers form seeds, and seeds create new plants and new life. Both Fading Blooms 4 and 5 are of Michaelmas Daisies. I love all the Aster family and these little lilac blooms are a last cheery farewell to the summer. So, I gleefully pick them and put them in vases around the house and studio. When they are about a week old the petals start to curl, as though they are part of a curled paper quilling set. I find this fascinating and find them more beautiful when they are in this state. 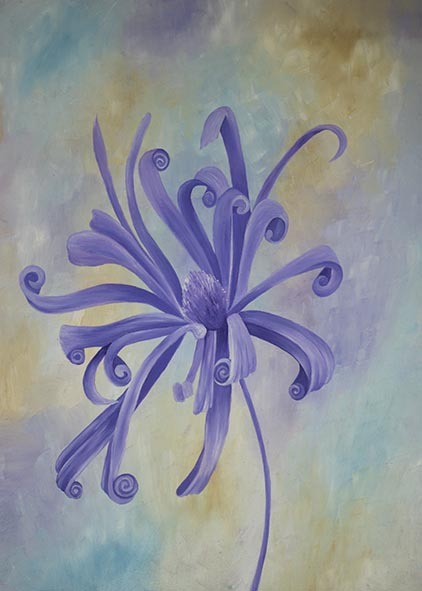 The curled petals are perfect symmetrical curls with equidistant space between each revolution of the petal. 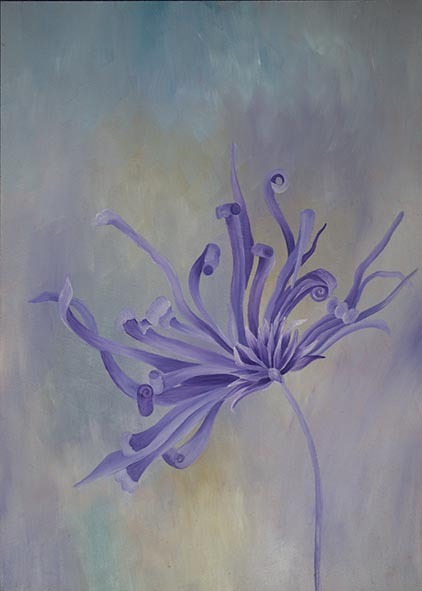 This painting was inspired by the end of season Anenome's in my garden. The flower petals arch back making the dark centre more obvious. 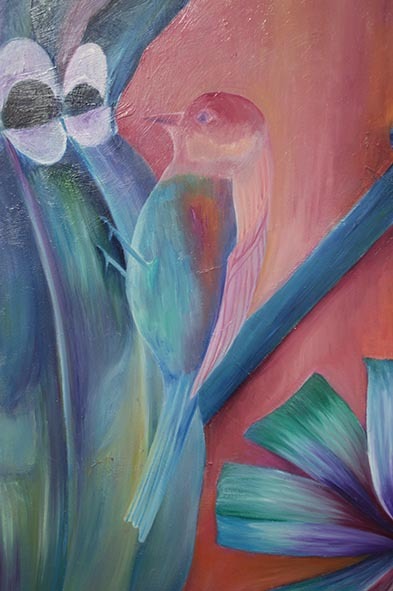 However this is not the only Fading Bloom in this painting. 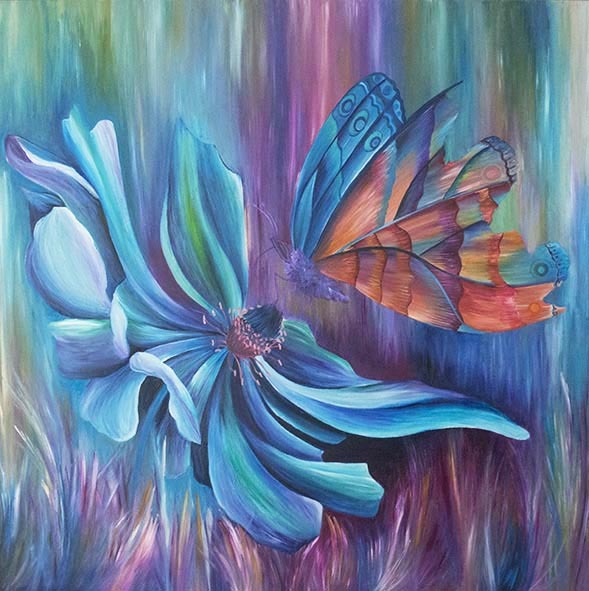 As butterflies age their wings begin to get tattered as their short lives near their end too. No less beautiful just passing on so the seeds and offspring can live the following year. The Amaryllis is the most majestic bloom that brightens up our Winter homes, however when it dies it is no less graceful. 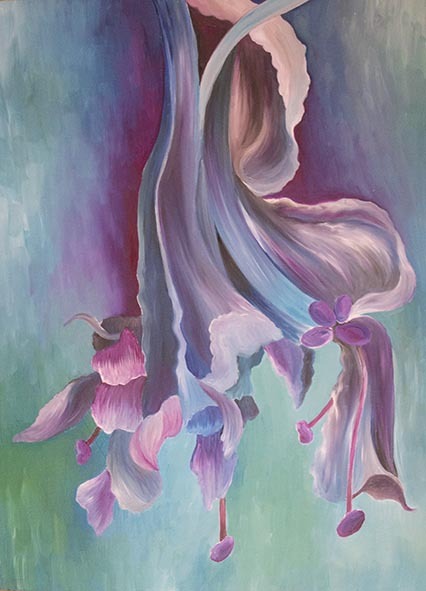 This painting is based upon the amaryllis falling from the bulb and hanging down vertically from it's pot. It was a white amaryllis which fades to pale brown, but in different lights whites and greys pick up many colours. This is another Amaryllis like the one above but in the fading light of day. 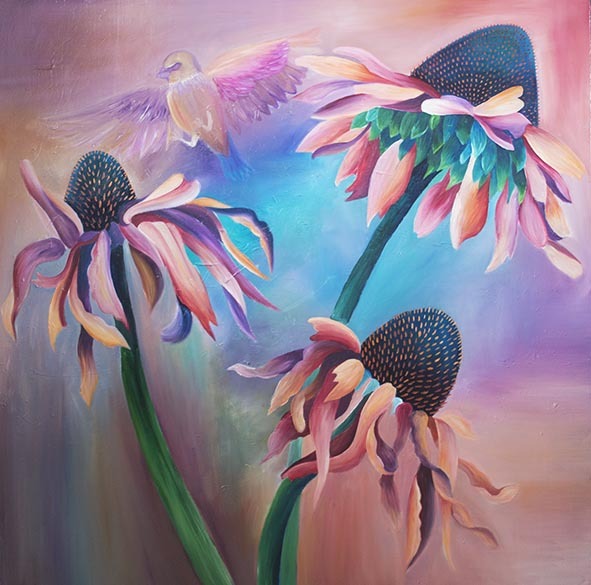 This painting is based upon the Echinaceas dying, with the centres becoming more domed shaped and the petals losing their vibrant pink colour and shrivelling and dying. Beyond the flowers is a goldfinch painted as camouflage to the background, because the dying flowers will give life and support to these birds during the winter. A reminder to every gardener not to clear their dying summer plants away. These are Autumn poppy heads before they have started to rot away and all the lovely reflections and forms you see on their skin. I have also hidden a little camouflaged friend as poppy heads with their seeds are crucial food for the birds who hang and pull them over as their seeds drop out so they can eat them. Gardeners are too keen to tidy seeds heads are great fuel for the birds throughout the colder months. The bird here is of no particular species and is camouflaged and smaller so the dead heads take priority in the picture ready to be picked and thrown aside. This is the tiny head of a Dandelion, with the little holes left after the seeds have flown. The dead petals hang beneath the head. 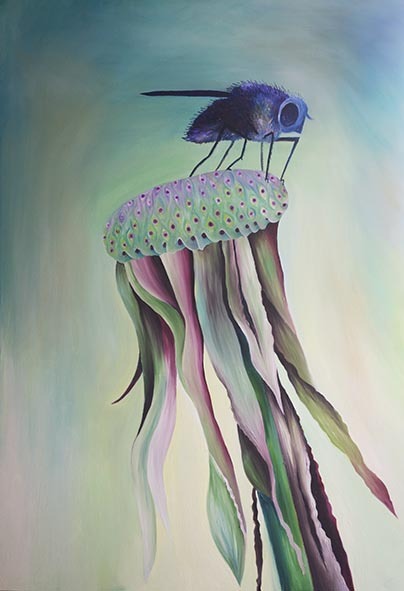 This took me a while to paint, as it kept looking like a jellyfish! But then, that is what I am fascinated about with regards to nature the repeating forms that look similar but are in a completely different environment of nature. The top of the dandelion has a similar pattern to a peacock. It doesn't matter what scale you look at the patterns and shapes within nature are familiar.